The building of a railway was announced by Sultan Abdulhamid II in 1900 that was to be financed and operated entirely by Ottoman subjects (although the principal engineer was a German). Suspicious of foreigners, but unable to maintain power without their help, Abdulhamid recognized that the construction of a railway to the holy cities of Medina and Mecca would not only improve his image as Caliph of Islam, but also increase the tenuous hold that the Empire had on the distant reaches of the Arabian Peninsula. The railway was never completed, however, as violent opposition from Arab rebels prevented the construction crews from reaching Mecca. The Turkish Ministry of War took over administration of the railway in 1911, and during World War 1 it became the target of Arab guerrillas organised by the Sherif of Mecca, Hussein Ibn Ali, his son Prince Faisal, and a certain British officer named T. E. Lawrence, along with the "Arabian Detachment", "C" Fight of 14 Squadron R.F.C. Funding for the Hejaz railway came from donations, the largest of which came from the Shah of Persia. Not all of the donations were voluntary, but those who did volunteer were rewarded with this medal. The medal came in both wearable and non-wearable versions ranging in size from 26mm to 50mm. The bulk of the medals had the Hegira date 1318, however special series of medals were issued bearing the dates 1322 (for completion of the rail link to Maan) and 1326 (for the link to Medina). The wearable medals were 30mm in diameter, issued in gold, silver and nickel alloy. Originally, the ribbon for all of the medals was red, about 20 to 25mm in width. 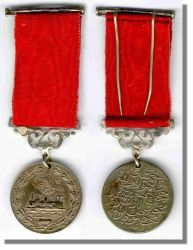 Those who had made large enough donations to merit the silver medal felt they should wear a different ribbon to differentiate their awards, and so a green ribbon was instituted to replace the red ribbons on silver medals.